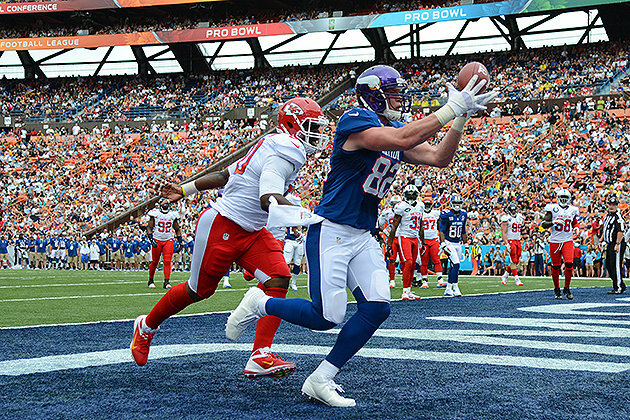 Fans with Pro Bowl tickets were treated to a shootout in Honolulu, as the NFC dominated the AFC, winning by a final margin of 62-35. Five turnovers by the AFC killed their chances of keeping the game close, as the NFC raced out to a 31-14 halftime lead. Vikings’ tight end Kyle Rudolph earned MVP honors after catching five passes for 122 yards and a touchdown. Seattle’s Russell Wilson also had a great game for the NFC behind center, tossing three touchdown passes in the third quarter to further pad the lead Drew Brees and Eli Manning helped build for him. On the AFC side, Bengals’ WR A.J. Green hauled in three touchdown passes, and LB Derrick Johnson returned an interception 42 yards for a score. Perhaps the best moment of the game came when Packers center Jeff Saturday, who is retiring this offseason, switched sides for a play in order to snap the ball to Broncos’ QB Peyton Manning. The two were longtime teammates on the Colts, and it must have meant a lot for both of them to share that experience. In another entertaining move, Texans’ defensive end J.J. Watt lined up as a receiver for a couple plays, but the former college tight end wasn’t able to snare a reception. The debate about whether or not to continue playing the game will drag on throughout the offseason, and Roger Goodell could have a tough decision to make in the coming months. But the current players definitely want the game to continue, not only for themselves, but so future football stars have the opportunity to experience the Pro Bowl as well. This entry was posted in NFL Tickets and tagged pro bowl tickets, prob bowl by promc58blog. Bookmark the permalink.